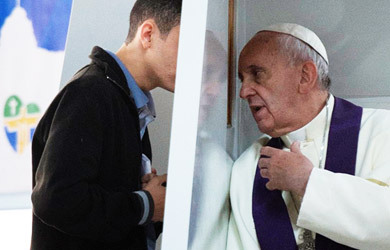 Many Catholics treasure the sacrament of Reconciliation. The peace of mind and soul which this sacrament imparts to us is one for which there is no substitute. It is a peace that flows from a certainty, rather than from an unsure hope, that our sins have been forgiven and that we are right with God. 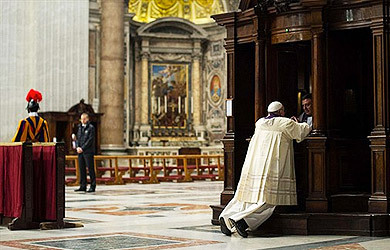 Although many converts to the Catholic Church initially fear it, they quickly come to love the sacrament of Reconciliation once they get over their nameless fears—fears which come from a misconception of what the sacrament really is. Although often called Reconciliation in common usage, the term “penance” best describes the essential interior disposition required for this sacrament. Before the time of Christ the virtue of penance was the only means by which people’s sins could be forgiven. Even today, for those outside the Church in good faith, not possessing the sacrament of Penance, it is the only means for forgiveness of sins. 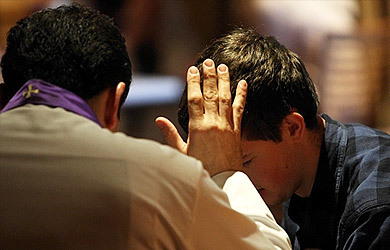 The sacrament of Reconciliation is a sacrament in which the priest, as the agent of God, forgives sins committed after Baptism, when the sinner is heartily sorry for them, sincerely confesses them, and is willing to make satisfaction for them. By his death on the Cross, Jesus Christ redeemed man from sin and from the consequences of his sin, especially from the eternal death that is sin’s due. So it is not surprising that on the very day he rose from the dead, Jesus instituted the sacrament by which men’s sins could be forgiven. It was on Easter Sunday evening that Jesus appeared to his Apostles, gathered together in the Upper Room, where they had eaten the Last Supper. As they gaped and shrank back in a mixture of fear and dawning hope, Jesus spoke to them reassuringly. As God, I have the power to forgive sin. I now entrust the use of that power to you. You will be My representatives. Whatever sins you forgive, I shall forgive. Whatever sins you do not forgive, I shall not forgive. Jesus knew well that many of us would forget our brave baptismal promises and commit grave sins after our Baptism. He knew that many of us would lose the grace, the sharing-in-God’s-own-life which came to us in Baptism. Since God’s mercy is infinite and unwearying, it seems inevitable that he would provide a second chance (and a third and a fourth and a hundredth if necessary) for those who might relapse into sin. This power to forgive sin which Jesus conferred upon his Apostles was not, of course, to die with them; no more so than the power to change bread and wine into his Body and Blood, which he conferred upon his Apostles at the Last Supper. Jesus did not come upon earth just to save a few chosen souls, or just the people who lived on earth during the lifetime of his Apostles. Jesus came to save everybody who was willing to be saved, down to the end of time. He had you and me in mind, as well as Timothy and Titus, when he died on the Cross. It is evident then that the power to forgive sins is a part of the power of the priesthood, to be passed on in the sacrament of Holy Orders from generation to generation. But certainly in our saner moments we find Reconciliation a sacrament that we love, a sacrament we would not want to be without. Just think of all that the sacrament of Reconciliation does for us! First of all, if a person has cut himself off from God by a grave and deliberate act of disobedience against God (that is, by mortal sin), the sacrament of Reconciliation reunites the soul to God; sanctifying graceis restored to the soul. At the same time, the sin itself (or sins) is forgiven. Just as darkness disappears from a room when the light is turned on, so too must sin disappear from the soul with the coming of sanctifying grace. When received without any mortal sin on the soul, the sacrament of Reconciliation imparts to the soul an increase in sanctifying grace. This means that there is a deepening and strengthening of that divine-life-shared by which the soul is united to God. And always, any venial sins which the penitent may have committed and for which he is truly sorry are forgiven. These are the lesser and more common sins which do not cut us off from God but still hinder, like clouds across the sun, the full flow of his grace to the soul. The restoring or the increasing of sanctifying grace and the forgiving of mortal and venial sins—is there anything else that the sacrament of Reconciliation can do for us? If it is a question of mortal sin, Reconciliation wipes out the eternalpunishment which is the inevitable consequence of mortal sin. It also remits at least part of the temporal punishment due to sin. The temporal punishment due to sin is simply the debt of satisfaction which I owe to God for my sins even after the sins themselves have been forgiven. It it a matter of “repairing the damage,” we might say. Mother forgives the disobedience and absolves from the punishment—but she still expects her son to make satisfaction for his rebellious outburst. It is this satisfaction which we owe to God for having offended him that we term “the temporal punishment due to sin.” Either we pay the debt in this life by the prayers, penances, and other good works which we perform in the state of grace, or we shall have to pay the debt in purgatory. And it is this debt which the sacrament of Reconciliation at least partially reduces, in proportion to the degree of our sorrow. The more fervent our condition is, the more is our debt of temporal satisfaction reduced. Still another effect of the sacrament of Reconciliation is that it restores to us the merits of our past good works if these have been lost by mortal sin. As we know, every good work that we perform in the state of grace and with the intention of doing it out of love for God is a meritorious work. It entitles us to an increase of grace in this life and an increase of glory in heaven. Even the simplest actions—kind words spoken, thoughtful deeds performed—have this effect, not to mention prayers said, Masses offered, sacraments received. However, mortal sin wipes out this accumulated merit, much as a man might lose his life savings by one reckless gamble. God could with perfect justice allow our past merits to remain forever lost even when he forgives our sins. But in his infinite goodness he does not make us start all over again from scratch. The sacrament of Reconciliation not only forgives our mortal sins; it also restores to us the merits which we had so willfully cast away. 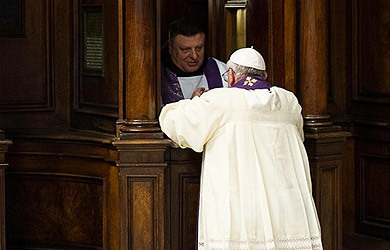 Finally, besides all its other benefits, the sacrament of Reconciliation gives us the right to whatever actual graces we may need, and as we need them, in order that we may make atonement for our past sins and may conquer our future temptations. This is the special “sacramental grace” of Penance; it fortifies us against a relapse into sin. All these results of the sacrament of Reconciliation—restoration or increase of sanctifying grace, forgiveness of sins, remission of punishment, restoration of merit, grace to conquer temptation—all these are possible only because of the infinite merits of Jesus Christ, which the sacrament of Reconciliation applies to our souls. Jesus on the cross already has “done our work for us”. In the sacrament of Reconciliation we simply give God a chance to share with us the infinite merits of his Son.